At this point in the rankings season, I'd usually be saying the competition is wide open and it's all to play for. Granted, there are still a good few weeks left but, just like the actual Formula One championship, things are very much headed in the direction of one particular driver. Every single day, Daniel Ricciardo is doing new and brilliant things to engage with fans and generally just bring the fun. Amazing. In this post, there's some Ricciardo points but also other drivers get a look-in. The rain in Japan meant we saw some more Suzuka sailboats, and there was some downtime for birthdays, bowling and some martial arts! +1 Fernando Alonso: Catching up with his old IndyCar pals! +2 Daniel Ricciardo: Never leave your phone unattended when Daniel is around. +2 Pascal Wehrlein: You're always going to get points with a submarine mention, loving the boat fun and games. +2 Stoffel Vandoorne: One point for joining the boating fun and one for the hat. +2 Romain Grosjean: RoGro has taken the whole cake thing a bit too far. +1 Sebastian Vettel: Training up the next generation of racers. 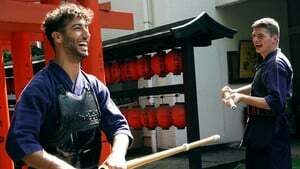 +2 Daniel Ricciardo: I'm mostly impressed that Daniel can channel his inner seriousness to take part in this scary martial art. +2 Max Verstappen: Max is almost unrecognisable in his Kendo gear. +1 Daniel Ricciardo: Being adorable with a fan who helped him out on Japanese public transport. +2 Lewis Hamilton: Love the gesture of renting out a whole bowling alley for a night out with the team. +2 Valtteri Bottas: Bottas seems to always draw the short straw when it comes to products to advertise. Tweets of the Week - Who runs the world?